CHICAGO (December 20, 2018) — Hyatt Hotels Corporation (NYSE: H) announced today the reopening of Bali Hyatt as Hyatt Regency Bali after five years of renovations. Continuing the hotel’s trusted legacy of Balinese hospitality, Hyatt Regency Bali confidently evokes the same sense of awe and admiration for guests as it did 45 years ago, while maintaining its celebrated Balinese aesthetic. A mere 22-minute drive from Ngurah Rai International Airport, Hyatt Regency Bali is centrally located in the heart of Sanur, and fully integrated into the local community. When guests step outside, they are immediately connected to daily Balinese life, including the familiar sight of fishermen with their daily catch and families on scooters amid the yoga studios, cafes and co-working spaces of today. Spread across more than 22 acres of land, Hyatt Regency Bali is one of the largest hotel developments in Sanur and situated on the area’s widest beachfront, known as one of the cleanest and most peaceful in Bali. The hotel also features lush gardens originally designed by famed tropical landscape artist, Made Wijaya, who created the Naples Botanical Garden in Florida. Featuring more than 500 plant species, these majestic gardens have graced the pages of multiple landscaping and coffee-table books. As part of the renovation, developers made a conscious effort to preserve all of the property’s mature trees and as many plants as possible. The original buildings and gardens of the hotel were considered one of Indonesia’s greatest treasures—one of the first examples of luxury Balinese design and landscaped tropical gardens in the world. Tierra Design of Bangkok and Spin Design Studio of Tokyo worked to rebuild structures and modernized the facilities while maintaining the look and feel of the original design, making sure to integrate the interiors with the stunning natural environment throughout. Upon arrival, guests will ascend the stone steps to the vast open-air lobby, where they will find the space creates a familiar, but modern Balinese atmosphere. The hotel’s lobby was remodeled to reflect its original design including its rustic thatched alang-alang (elephant grass) roof, which has been expanded to provide improved views of the gardens and stunning Indian Ocean. Throughout the hotel, local materials and techniques, such as hammered copper, rattan, bamboo and coconut shell, have been integrated along with batik printing blocks, Balinese wood, stone carvings repurposed as wall art and sculptures. Hyatt Regency Bali features 363 rooms spanning 290 to 871 square feet, including suites boasting a private balcony overlooking the lush gardens or Indian Ocean. 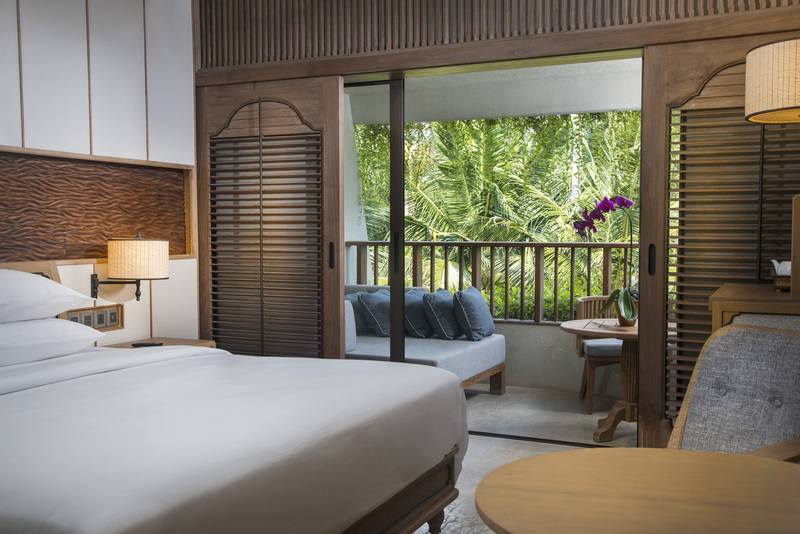 A study in modern tropical design, the rooms feature myriad Balinese touches from distinctive carved banyan wood or half-split bamboo wall panelling to woven rattan panels on doors and furniture. The hotel includes 39 one-bedroom suites with spacious balconies up to 753 square feet in size. With a separate living room that can accommodate an extra bed and an additional powder room with a shower, the suites are ideal for families and groups. In addition, booking a suite includes access to the Regency Club Lounge offering a private concierge and complimentary breakfast, all-day snacks and evening cocktails and canapés. Hyatt Regency Bali showcases three unique open-air drinking and dining venues, each serving authentic dishes using the freshest local and organic ingredients available. To minimize its environmental impact, the entire resort and all dining outlets use minimal plastic, opting instead for paper straws, recyclable coffee cups and bags made from bagasse (sugar-cane pulp). Omang Omang is the hotel’s all-day dining space offering comfort food from Indonesia and around the world. Alongside views of the gardens and pools, Omang Omang serves a buffet breakfast, resort favorites available all day, charcoal-grilled seafood and prime cuts in the evening, as well as Es Campur (coconut shaved ice), a local specialty. Offering stunning sea views and breathtaking sunsets, Pizzeria is a casual venue overlooking Sanur Beach. The restaurant specializes in pasta cooked à la minute, pizza baked in wood-fired ovens, frozen cocktails and Italian sodas muddled with fresh fruit and herbs. Piano Lounge is ideal for a quiet drink, casual business meeting or social gathering. The venue features live music, including gamelan (Indonesian percussion) during the day and piano by night. Continuing the Indonesia tradition of arisan, where ladies congregate, the outlet offers a signature afternoon tea, along with a selection barista-made Indonesian coffee and loose-leaf tea. Hyatt Regency Bali features three swimming pools located just along the beach, including a lap pool, children’s pool, and main pool area that is surrounded by bounteous overhanging bougainvillea where guests can swim through a replica of Goa Gajah–the 9th-century ‘elephant cave’ temple near Ubud–carved out of volcanic rock. The fitness center is open 24 hours a day and features floor-to-ceiling windows that offer guests stunning garden views as they work out on the latest Precor strength and cardio equipment. Opening in January 2019, guests can relax at Shankha Spa, where they will be greeted by an open-air walkway surrounded by ponds. The vast complex comprises ten spa suites–each a mini spa within itself–housing a treatment area, relaxation area, shower, changing room, vanity area and private garden complete with an outdoor whirlpool ideal for watsu (aquatic massage) treatments. The spa menu features a list of treatments inspired by Balinese wellness techniques that incorporate local ingredients. The space also features a second lap pool overlooking a reclining statue of Ganesh, an open-air juice bar, a yoga studio, a relaxation area, and outdoor hot and cold plunge pools. Hyatt Regency Bali also offers Camp Hyatt, where kids can discover an outdoor playground, an indoor playroom filled with toys and games, and a daily program designed to both entertain and educate with Balinese arts, crafts and cultural activities. Tierra Design and Spin Design Studio drew inspiration from wantilan, a traditional Balinese community pavilions, to create a compound of event spaces arranged around a central outdoor courtyard. Featuring a separate entryway for streamlined arrivals and drop-offs, the hotel’s meeting facilities include five separate gathering spaces each offering glass walls that bathe spaces in natural light. The 5,037 square-foot ballroom features a show kitchen for live culinary action and can accommodate up to 600 guests for cocktails. Four additional multifunctional meeting spaces range from 1,000 to 3,487 square-feet and can accommodate 25–150 guests. The 2,583-square-foot courtyard is ideal for Balinese dance performances and available for outdoor events of up to 120 attendees.